So you’ve booked a flight, now you want to know the details? Alice Springs Complimentary transfers to and from your accommodation included with every flight. Meeting times vary throughout the year but are about one hour before first light. The exact time will be confirmed when you book. You will be with us for approximately 4 hours depending upon where we land. Flight distance will typically be between 10 and 20 kilometres. The balloon flight takes place approximately 15 kilometres to the south of Alice Springs adjacent to the MacDonnell Ranges and over the historic Owen Springs Cattle Station. We ask that you reconfirm the day before the tour. Please use the toll free number 1800 809 790 or +61 8 89528723. This is to check pick up time and also to advise us of room numbers. It is extremely important to be able to locate you if the weather is inappropriate for ballooning or in the event that you sleep in. Mobile telephone numbers are also very helpful and should be left on the night before your tour. Safety is our primary concern and if you are prevented from flying due to unsuitable weather conditions you may either rebook to another day or receive a full refund. The pilot’s decision with regard to safe flying conditions is final. Where possible, the balloon flight should always be booked for the first available day in the area to allow for re-booking in case of bad weather. The advertised price includes a mandatory Civil Aviation Safety Authority Insurance. This insurance charge is $30 and applies to all passengers regardless of age. If you book through an agent the insurance component is payable separately by cash or credit card on the morning of the flight. If you cancel within 24 hours of departure, do not show up on the morning of the tour or suffer “cold feet” on the launch field you will not be given a refund. Please note: If you book through a third party, (ie travel agent or tour desk) Outback Ballooning recommends that you check their cancellation policy carefully & take out travel insurance, as a third party cancellation policy may differ. It is dusty in the Outback. Outdoor clothing (preferably not white), long pants and hat or cap are recommended. Enclosed flat heel shoes are essential. It is no colder in the balloon than on the ground but it can be cooler before sunrise. Warm clothing may be necessary from approximately May to September. Loose items such as dangling jewellery and scarves are not permitted once passengers reach the launch site and dis-embark from the bus. Physical fitness is not a requirement to enjoy a ballooning adventure, but passengers must be able to climb up and into the basket (approx. 1.2 metres in height) unaided using the basket foot holes and stand for the duration of the flight. Civil Aviation Safety Authority (CASA) rules and regulations and Outback Ballooning’s policy prevent us from flying women who are over 12 weeks pregnant. Pregnancy must be advised in advance. Illness and/or recent operations that may affect the person or other persons on the tour must be notified to Outback Ballooning in advance. Medication should be brought on the tour. The packing up tasks at the end of the flight are optional and we would appreciate your assistance in these enjoyable activities. However, they do involve some lifting and participation is entirely voluntary. Passengers that are less able bodied are invited to stand back and take photos. Persons with medical conditions participating in the balloon flight and pack up activities do so at their own risk. Any form of disablement must be discussed with Outback Ballooning prior to making a booking. Each person is considered on an individual basis. The flight and carriage of any passenger will take place at the pilot’s discretion. 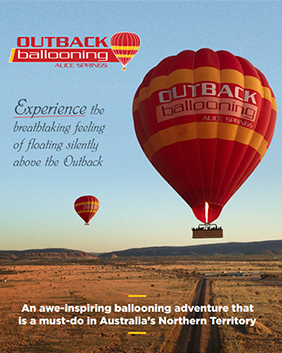 After landing Outback Ballooning has designed its program to allow you a unique opportunity to experience the Australian bush. Most of our landings are in the desert kilometres away from the nearest road. There is no traffic, no other people and no noise. The perfect place to enjoy a glass of sparkling Australian wine or if you prefer our tropical apple and guava juice. Perhaps mix the two for a delightful morning cocktail. Drinks are accompanied by a variety of muffins, slices and biscuits, cheese and fresh fruit before sadly reboarding your bus to return to “town”. If you would like to come and watch their friends/family take a hot air balloon flight, then a balloon chase is for you! We will pick you up with your group in the morning and travel to the launch site and watch as the balloon takes off. You will then travel through the desert tracks with our crew to where the balloon lands. Once you re-join your group, you can help pack up with balloon or take photos the choice is yours. You will enjoy a glass of sparkling wine or fruit juice with the light refreshments before returning to town. Must be booked in conjunction with at least 1 adult balloon flight. Children must be accompanied by an adult on the balloon chase. Request basis only as limited space available on each tour. There is no turbulence or vibration as the balloon moves with the wind. With eyes closed it is impossible to tell that you are flying. It is no colder in the air than on the ground. It is a fact it is often warmer with the burners overhead and the balloon flies above the night time low level cold air temperature inversion. Fear of heights is not generally a problem as the basket sides are high and secure and there is no vertical ‘face’ between the balloon and the ground. The sensation is similar to looking out of an aircraft window but it is much bigger with no glass!